This is an impractical and detrimental decision by our council. Because – if anybody wants to apply for a state PSC, NRHM,NHM or NAM jobs – they must have concerned state council registration. These PSC exams are once in 3 to 5 years only. So if they surrender their native registration and apply for a new registration in the state where they are working as teachers or Medical Officers in the private colleges with a temporary job with a less salary – they will lose a permanent chance or job in their native states. Then what is the need for central registration ?? Otherwise – council must instruct all state governments that – only a central registration is required for PSC, NHM or NRHM Jobs. Applying for a central registration is a tedious process now – may take years to get a response from the council. As per reliable sources council already started collecting data from all state councils. Then what is the necessity of registration in the concerned state? This order is against the council’s act. 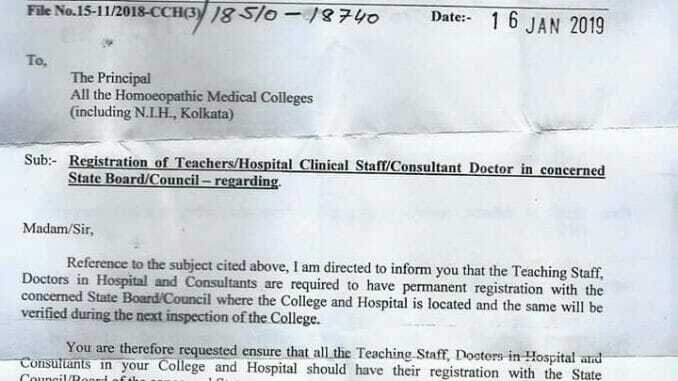 As per the norms of the council “Any person who has registered on any State Register of homoeopathy will be included in the Central Register of Homoeopathy (Section 21). Any person who has a qualification included in the second or third schedule (BHMS, MD (Hom), DHM, DHMS, MBS, MF Hom, etc.) has right to practice homoeopathy in any state (Section 15 (1) (b), and Section 26 (2)).” Then15(2) also. Council also instructed to start Adhar based Geo Location based attendance system in all homoeopathy medical colleges – then why to worry about duplicate faculty or Ghost faculty ?? It’s against the law any medical college regulations. Section 26(2) of HCC Act is not relevant but Section 15(2) is quite relevant.